An extended and superbly maintained Detached home of much character located in a prime South Croydon road backing Croham Hurst Woods, within walking distance of South Croydon train station, Lloyd Park Tram stop and frequent buses, making this a fabulous home for those commuting. With vast accommodation and the potential to create a ground floor annexe making this ideal for an extended family this delightful home must be viewed. Additionally the area is well served with a selection of reputable schools for children of all ages to include Whitgift, Royal Russell, Croydon High and Coloma. This well maintained home has been lovingly cared for approached via a wide carriage driveway providing ample off street parking leading to the a large garage. A wide solid oak front door under a canopied porch leads to a spacious Entrance Hallway accessing a 24' x 15'9 Lounge with the most beautiful, large fireplace and leaded light double glazed windows, separately off the hallway is a wonderful 20' Dining Room, an ideal space for large families with doors providing direct access to the rear gardens. 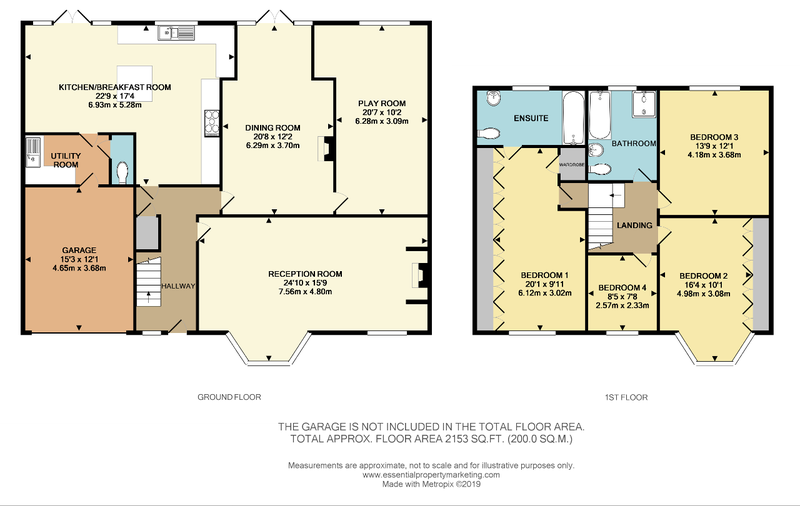 Off the dining room is a super Entertainment Room/Play Room again measuring 20' (being an ideal space to create an annexe). The Kitchen/Breakfast room is well fitted with centre island and integrated appliances providing a great family space being approx 22' x 17', off here is a separate Utility Room and Ground Floor Cloakroom. To the First Floor is a spacious landing accessing all of the bedrooms the Master Bedroom being 20' with a spacious En-Suite Bathroom and finally a great sized, re-fitted Family Bathroom. Externally the property enjoys Large Gardens in excess of 100' and are mainly laid to lawn with a large patio creating a delightful space for entertaining. These details do not constitute any part of an offer or contract. Any intended purchaser must satisfy themselves by inspection or otherwise to the correctness of any statements contained in these particulars. The vendor does not make or give and neither shall Hubbard Torlot or any person in their employment, have any authority to make or give any representation or warranty whatsoever in relation to the property.